This one’s really too easy. 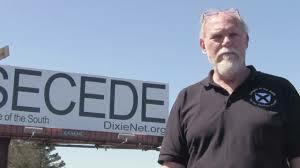 Michael Hill is co-founder and president of the League of the South (LOS), whose goal is – if you’re living in a bubble – to get the former slave states of the American South to secede. Hill is a Neo-Confederate, a white supremacist (he has complained that the South at present isn’t racist enough) and – for good measure – explicitly pro-slavery. Hill actually taught history at Stillman College for a number of years before he founded the LOS together with J. Steven Wilkins and some other Neo-Confederates and co-authored the “New Dixie Manifesto” (with Thomas Fleming). According to Hill, his (“complete”) rejection of racial equality is based on science: Equality is “a flawed idea with no basis in history and biology,” which seems to suggest that he doesn’t really have a clue what “equality” is supposed to mean. And how on Earth could someone, as Hill sees, it justify calling slavery “an abomination”? Surely, it’s “not in the Bible. [Slavery] is regulated there, which means it is an institution approved by God for use in a fallen world.” And if you disagree (or worse, don’t denounce homosexuality) you are a terrorist: “You [sic] worldview is a terror to the truth.” Ouch. Much of his writing concerns the atrocities committed by Northern libruls to southerners, both during the Civil War and by “the civil rights movement (what we Southerners rightly call the Second Reconstruction),” such as immigration reform, which Hill calls “genocide; this is anti-white genocide,” and which will lead to civil war. Which is what he wants. LOS apparently also has a paramilitary wing now. Which should, in fact, potentially be considered a concern, given that Hill thinks the Second Amendment extends to “weapons systems”, has defended guerrilla warfare applications and even produced a list “primary targets” in the fight for a second secession: “The primary targets will not be enemy soldiers; instead, they will be political leaders, members of the hostile media, cultural icons, bureaucrats, and other of the managerial elite without whom the engines of tyranny don’t run,” Hill wrote, before ending by quoting the Bible: “Blessed be the Lord my strength who teaches my hands to war and my fingers to fight.” Sounds uncannily like some other organizations and networks you might think of, doesn’t it? Diagnosis: I don’t think someone who is president of the League of the South need any further diagnosis. If he's dissatisfied with this country, there are about 200 others to which he's welcome to skedaddle. Idiots like him want all the freedom we have in America...BUT, just for anyone that thinks just like HE does, and no one else. Like the pigs in "Animal Farm"; "Everyone is equal, but some are more equal then others!" Raving lunatic, and basically a laughing stock nutcase.